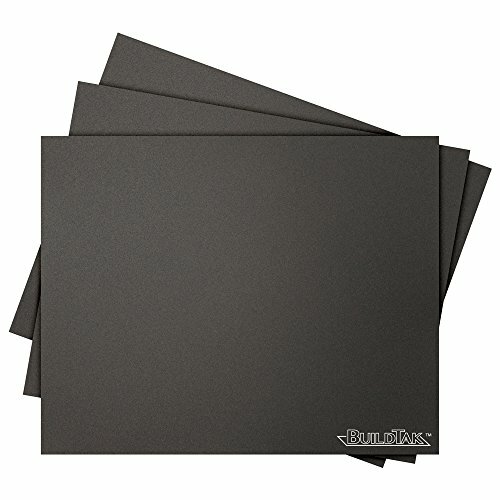 The Buildtak 3D-printing build surface is an 8" x 10" rectangular sheet that adheres to a print bed of a fused-filament 3D printer (sold separately) to help the filament stick during printing, while also enabling clean removal of the printed part afterward. The sheet is compatible with ABS, PLA, HIPS, PET+, brick, wood, and flexible (TPE) filaments (sold separately), and has a durable construction that allows for multiple uses with either the same or different filament material. The build surface can also be used with nylon and t-glase when a thin layer of washable glue stick (sold separately) is spread onto the surface. It installs more quickly and with fewer bubbles than tape or films.